You will eat three bowls of this soup! I have been really lucky with Pinterest recipes lately. Mr. Bee had a cold and I thought a good chicken soup would make him feel better. It wasn’t the cool 60s weather I would prefer, but at least it was cloudy which gave the illusion it was cold outside. 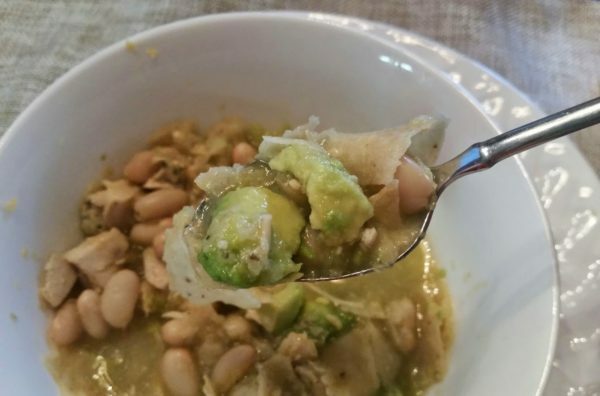 It only has five ingredients…chicken, chicken stock, a bottle of Salsa Verde, cumin and great northern beans. I used one chicken breast I already had cooked in the fridge, and a can of chicken. Mix it all together in a pot. I simmered mine on the stove for about an hour, but since everything is already cooked when you put it in, you could eat it as soon as the ingredients are heated through. 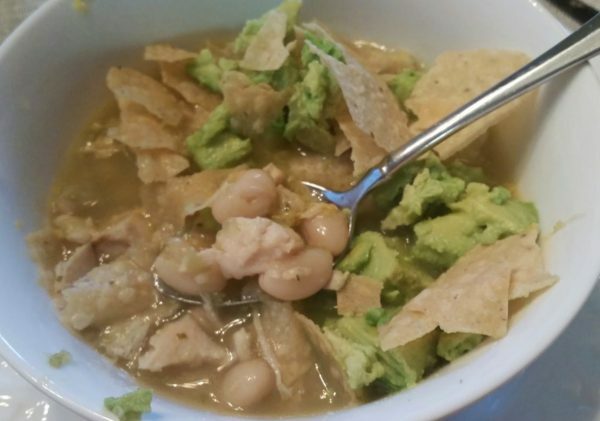 I ladled the soup into bowl and topped with little bit of Mexican blend cheese, sliced avocado and tortilla chips. It was awesome. For the complete recipe go my Pinterest board on soup.